What is a Crib Sheet? A crib sheet is a sheet that fits over the crib mattress. They are available in a a standard size that will fit most standard cribs. Although you may have chosen a bassinet for your baby’s first few months, in which case you will need a different size of crib sheet. The mattress of a bassinet is thinner than the one in a standard crib. 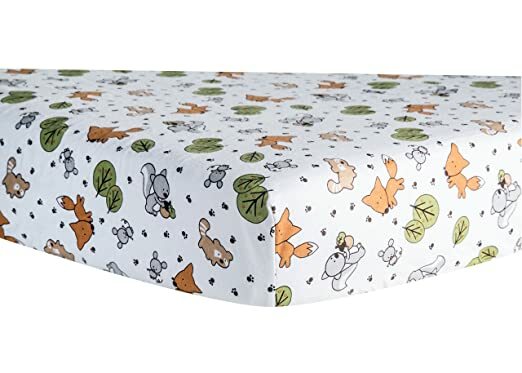 Crib sheets are mostly fitted sheets, but there are still non fitted crib sheets available. 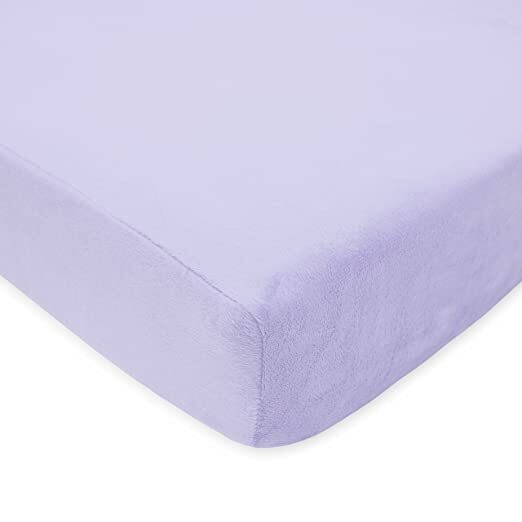 Fitted sheets have an elastic in them to keep the sheet on the mattress. 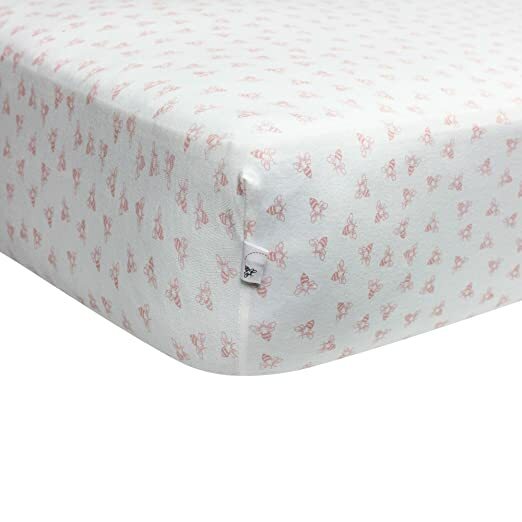 Non fitted sheets don’t, and this can make them loose, and your baby might be able to get tangled up in them. You should buy two or three crib sheets, so that you can have a rotation. This means that if your baby spits up on one sheet, you can change it for a clean one, while still having a spare in case of any other accidents. You should always wash brand new sheets before using them. The manufacturing process can leave excess dye, and other chemicals behind, but washing them before use removes this. In terms of the general care of your crib sheets, wash them according to the manufacturer’s instructions. Some sheets can be tumble dried, but others may not be suitable. Change the sheets once a week, or sooner if there’s spit up, vomit, or a leaky diaper, and replace them when they’re showing signs of age. When storing crib sheets, fold them up as you would fold a fitted sheet for your own bed, and keep them in a drawer or closet. Don’t store them in a container, as they can trap moisture, which allows mold and mildew to develop. When you’re shopping for the best crib sheets, it can be easy to become drawn to complete bedding set. It can seem like they’re the best option as they include sheets, blankets, and bumpers all in one, but generally, if you buy all these things separately then you get better quality items. Check the thread count of the crib sheets. The thread count of any sheet is the amount of thread in one square inch of material. It tells you the quality of the sheet. A high count is a higher quality sheet. Avoid any sheets with a thread count of less than 200. Sheets with a thread count of 300 are good quality, and anything over 400 is the best. Crib sheets are available in a wide range of materials, and each has its own advantages and disadvantages. Cotton is a very common material used for crib sheets. It’s very breathable, is easy to care for and durable. Although it can be expensive to buy 100% cotton sheets, t can wrinkle easily, and inexpensive cotton tends to shrink in the wash.
Polyester sheets are also very common, and they are less expensive than many other materials. They’re also durable, and can be very comfortable. But the texture and quality of the polyester varies greatly between different brands, and they wrinkle, and pill easily. Flannel sheets were once the most popular choice of crib sheet. They keep in heat so they’re perfect for cold weather, but they pill easily, and are completely unsuitable for warm weather or climates. The American Baby Company’s Heavenly Soft crib sheets are 100% polyester chenille, and with a rating on amazon .com of 4.8 stars, they are one of the best crib sheets available. They are super soft, and they are machine washable, and can be tumble dried. They come in 19 different color and design variations. This is a great crib sheet for winter, and colder climates. It retains heat really well, which isn’t suitable in summer. It is really soft, and it washes incredibly well. Burt’s Bees Baby Honeybee crib sheets have a 4.6 rating on amazon.com. They are made from 100% certified organic cotton. They are durable, and soft, and they become softer after every wash. The honeybee print is available in four color choices. These are fantastic, and adorable sheets, but they can shrink if washed on a too high setting. The fabric can seem a little thin, but they do hold up well to use. These Trend Lab sheets are one of the best crib sheets on amazon.com, with a 4.9 star rating. They have a cute, colorful design, and are made from 100% cotton. They are machine washable and they wash well without shrinking or color fading. The Trend Lab crib sheets are very cute. They’re well washing, durable sheets that are reasonably priced. They can pill a little after many washes, but there’s little to no color fading, and they fit a mattress snugly and securely. These organic jersey cotton sheets have a 4.9 star rating on amazon.com, and are made by My Little North Star. They are made from 100% organic cotton, and wash very well. They come in a pack of two, one has a cute elephant design, and the other has stars. Both designs are quite neutral, and would match in with any nursery. Overall these sheets are amazing, but as the packaging isn’t chemical free, they need to be washed well before use. Otherwise, they are fantastic value for money, and they are GOTS certified organic. 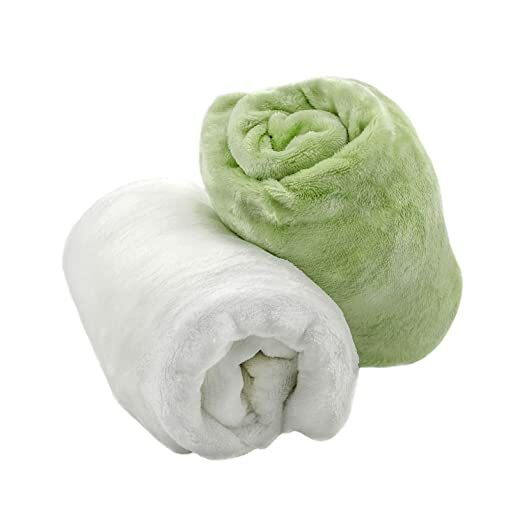 The Cozy Fleece Microplush fitted sheets are one of the best crib sheets for winter, and colder homes. They have a 4.5 star rating on amazon.com. They are made from 100% polyester, and with a micro plush construction, they are exceptionally soft. These are great for winter. There’s a lot of color choice, and they come in a pack of two. They fit a standard crib very well. The 4.5 star rating on Amazon is mostly due to price discrepancies. 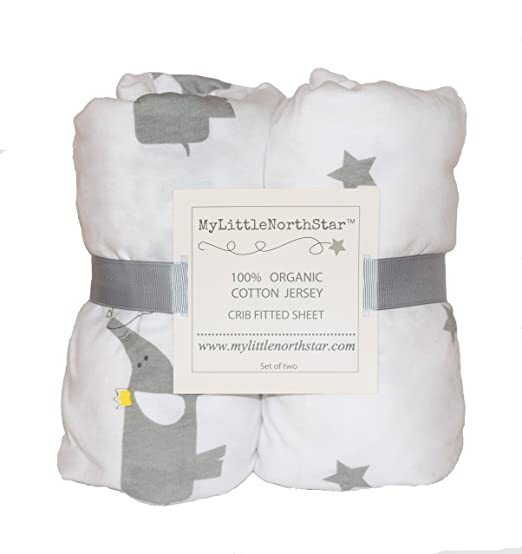 The overall winner is the My Little North Star organic jersey cotton fitted crib sheet. These sheets are certified organic, reasonably priced, and they fit perfectly. They wash well, and are machine washable. The design is adorable, and neutral, so they will look amazing in any nursery. They retain heat which makes them perfect for winter, but they would also be perfect in a colder home in summer, especially for heat-sensitive babies.